Interviewer: Hi Steve! How are you doing today? Steve Farzam: Hey, good morning! How are you? Interviewer: I’m doing well, thank you. Interviewer: So today we’re going to talk about eco-friendly systems in the hospitality industry. Can you give me a little bit of background on what your take is on eco-friendly hospitality? Steve Farzam: Sure. 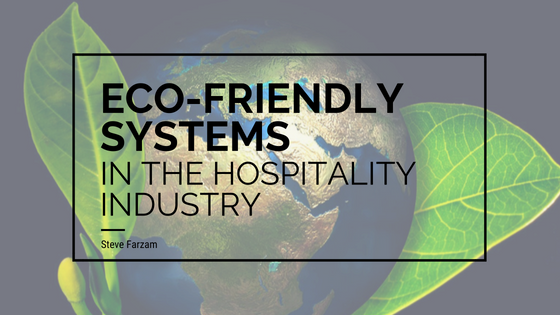 Eco-friendly hospitality, great question, is a newer growing trend that we have in the hotel industry. It essentially establishes a bar for a more responsible carbon footprint that we all leave behind. Particularly, raising awareness amongst not only hotel staff, but our guests that frequent our properties to really give them the ability to be mindful of their effect on our environment and how it affects our community and their communities, and give them an opportunity to make a small difference, which everybody getting together and making a difference really has a bigger change for the whole. Interviewer: Wow that sounds awesome! So what aspects of eco-friendly systems are incorporated at the Shore Hotel? Steve Farzam: Great question. Shore Hotel is one of the newest hotels in Santa Monica and we have really set the benchmark with eco-friendly systems. Top-down, from the very beginning of the inception of the design build where we sourced most materials within five hundred miles at the hotel, all the demolition that occurred with the properties before that were there, we recycled 89 percent of the materials to proper landfills with the remaining parts that could not be recycled. Steve Farzam: The hotel itself that is there now, we have approximately 164 guest rooms and we are a four-star hotel. What makes the Shore Hotel particularly eco-friendly is you walk into a guest room and from the flooring that is made of recycled content, to the lights in the room that are the most efficient LED light-emitting diodes, up to the design of the windows in the rooms. We essentially have the windows facing towards the horizon, which would allow for the most natural light to permeate the room, in other words, allowing the guests to use less lights in the room. Just a couple examples. I mean, I could go on and on. On the roof we have a recycled material that’s a polymer-like plastic, which is made of recycled material and has a 50-year life on it and it’s made of white plastic. Essentially what this does is it bounces off the heat rays and prevents heat islands from developing on the roof, which in essence, cools the building down, so it’s less air conditioning needed in the guest rooms. Steve Farzam: So we did a bunch of things. One of the things that I’m particularly proud of – we were the first hotel in the entire United States that put our foot on the branch, and we were a little scared about it but you know, no risk taken, nothing ventured. What we did is, we partnered up with Southern California Edison, which is our power company, and we instituted a one-time pilot program – which has now grown exponentially – and is called the Demand Response Program. This Demand Response Program essentially does the following: the power company is able to look at the forecast and the days to come and determine what days going to be really hot. And we know in Southern California what’s hot to us; people tend to turn on their air conditioners on full blast and run their washing machines through the day and really drain the grid. If you recall back in the days, we had brownouts and blackouts, and all kinds of other horrific things that happened with our grid system that really takes out tens of thousands of homes and businesses, and really affects the critical infrastructure in our communities. Steve Farzam: So what the Demand Response Program did and does is, on those days where there’s a critical peak need, without any human intervention, the hotel receives an automated response and we are able to shed our load by nearly 60 percent. Steve Farzam: In other words, the lights automatically dim down. The elevators only work upon you hitting the button, they don’t swirl around. The air conditioners all reset our tillers to a set temperature. It’s more eco-friendly and our guests really don’t even notice the difference. The parking garage changes its sensitivity levels for that few hours and it really makes a difference and it’s been a blast. It’s been a great partnership and done so well. Interviewer: Yeah, that’s awesome! I mean it sounds really impressive and you have a lot of really great energy-efficient systems within the Shore Hotel so that’s awesome. Steve Farzam: Yeah, it’s really been great and we have such an amazing staff. I could go on and on with their desire to want to wear recycled uniforms, to even incentivizing our hotel staff to take public transportation. We pay 100 percent of their public transportation as opposed to letting them park at the hotel for free, just so we can send a message that public transportation is better for less traffic on the roads. It’s better on so many levels; the smog, the carbon footprint. It’s a winner all the way around and the staff love it too. Interviewer: That’s incredible. You also spoke about cogeneration in one of your recent blog posts. Can you expand a little bit on that topic? Steve Farzam: Absolutely. Cogeneration, or also known as co-gen, is just such a fascinating system that it really caught my eye the first time I heard about it and I actually met with a NASA engineer who, over coffee, gave me the breakdown of how the system works. I think it’s under-utilized and not a lot of people know about it, and I really see it coming to the residential side of homes maybe in the next 10 to 15 years. But essentially, co-gen, co-generation, you have two forms of generation and what it is is, it’s a refrigerator-like size machine, and most people know about a generator in their home. When the power cuts us off, what happens? The generator comes on and it usually runs on diesel, which is not a very sustainable fuel option. Interviewer: No, not at all. Steve Farzam: Yeah, and it just creates power, which works for hospitals and businesses that need that critical infrastructure, like fire departments and police departments and stuff like that, but what co-generation does, it essentially is the same thing. It generates power, but it works with natural gas, which is a much eco-friendlier fuel and it’s abundantly available in California. What’s really neat about this is the natural gas comes into this unit, it creates 100 percent smog-free electricity, and the beauty about it is the off, if you want to call it, the heat that’s offset from the generator, is then used to heat up the water. So you get double bang for your buck. You’re getting electricity and the heat that comes off of the generator, which is a substantial amount of heat, we use to heat pools, to heat water in the guest rooms, and it is just the newer generation of the old school solar panel that people would use the heat up their water for their pools. It is very efficient, it’s very resourceful, and it’s just an amazing tool and it’s just a remarkable piece of machinery and technology. Interviewer: I I mean yeah it definitely sounds like that. Thank you very much for the background. Steve Farzam: Sure, sure thing. Interviewer: Awesome. On a more basic level, in what ways, in your opinion, can hotel guests contribute to a cleaner environment? Steve Farzam: Yeah, or providing them bicycles for their family to take a ride instead of doing a rideshare or renting a car, those kinds of options. We also offer a fleet of eco-friendly vehicles and we have also a charging station at the hotel. We were the first hotel in California to have a level two fast charge. It was a grant that I worked on with Nissan with their lease and also with the department of transportation. We educate the guests on those types of initiatives. We have two trash cans in every hotel room. One is dedicated for recycling, the other one is for regular trash. So, every step of the way, we are mindful about our involvement with the environment and basic ways that we can help the environment by even simply asking a guest upon checkout, do they want a printed receipt or would they like one emailed to them? And if they wanted a printed one, no problem. Guess what? It’s coming out on 100 percent recycled paper. Steve Farzam: Yeah, it’s really cool. And those are just a couple things. And the last thing I will say is this: our hotel is open to the public, guests, but other hotels alike. We invite other hotels that are either in their grand opening phase or their pre-grand opening phase to come out. What we do is not a secret and we don’t see other hotels as a competition. We see them other entrepreneurs trying to do well and we’re all providing a service, and if we can all provide a better service, so be it. Come check out what we’re doing at the Shore Hotel. Our door is open and we love to share what we’re doing if we can make your property a better place. Interviewer: That sounds incredible. You’ve definitely made some very great strides incorporating eco-friendly systems within the Shore Hotel and contributing to the hospitality industry in general. So thank you so much for taking time out today and sharing this information with me. Steve Farzam: Sure, thank you! Interviewer: Yeah of course! Have a great day. Steve Farzam: You too, have a wonderful day.